It's World Pistachio Day! Party Favors For You! Did you know that? Did you even know there was such a thing? Me neither. That is, until I met the lovely folks behind Wonderful Pistachios (at FoodFete). They sent me home with a ton of pistachios, which is a good thing, because man. I love pistachios. There's something so satisfying about prying the shell open and devouring the little green nut inside. Anyway, today is World Pistachio Day! Celebrate good times, come on! 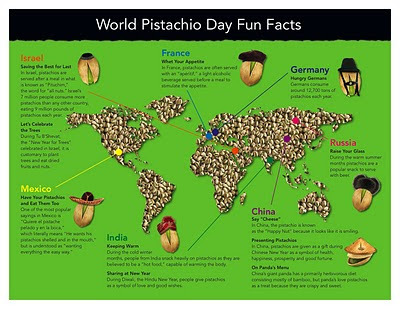 And now, a word from the wonderful folks at Wonderful Pistachios (you may know them from their funny ads). 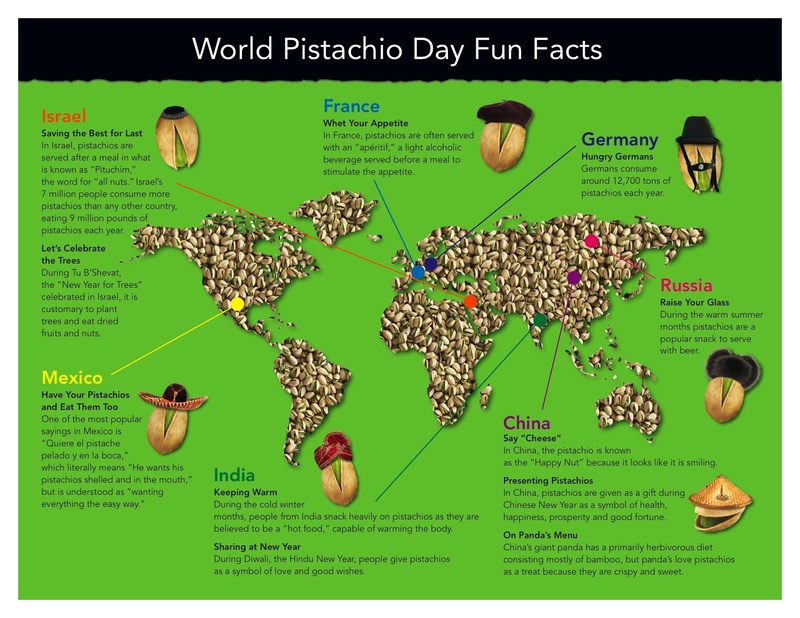 February 26 is World Pistachio Day, encouraging us all to take a moment to reflect on the amazing history and modern day health benefits of this wonderful nut. Did you know that pistachios are one of the oldest flowering nut trees? Evidence suggests that humans were enjoying them as early as 7,000 B.C.! Dubbed “the skinny nut” by nutrition experts, pistachios are one of the lowest calorie, lowest fat nuts! U.S. President Barack Obama is a self proclaimed fan of snacking on pistachios! For more fun facts, click here! Ok, ok, pistachios are really good and all, but am I really just posting a whole post about pistachios for no reason other than because it's their special day? Well, as much as I love any reason to celebrate, the most awesome part of all this Pistachio Party Time is that one of you lucky readers is going to win a sweet stash of these salty snacks! The kind folks at Wonderful Pistachios are offering a giant (24 oz!) bag, as well as several small (8 oz) "snack" size bags as a way to celebrate World Pistachio Day. Which, again, is today. In case you missed that. So how do you win? Leave a comment telling me how you deal with the shells. Do you keep a little bowl inside the big bowl? Do you scatter them all over the floor? Use them in your compost bin? Do you have a ridiculously awesome (but sort of mono-tasking) contraption like this? Let me know and you could win a pistash (ha ha, get it) of your own! For extra entries, tweet this contest, share it on facebook, and/or blog about it - and then come back here and leave a comment for each thing that you do. There is no limit to number of entries, so get crackin'! I'll be choosing a comment at random, and the contest is officially closed on Tuesday 3/1/11 at 11:59pm PST. Oh, and super awesome bonus? My friend Suki is also giving away pistachios! Her contest ends at 11:59pm TONIGHT though, so if you want to enter, head on over to her blog! It's been a while since I blogged about personal finance/budgeting and such, and I've been thinking a bit about it lately, so here ya go. Topic #1: Credit! Hi. My name is Kim, and I just got my first credit card. Yes, my first. Yes, I am almost 27 years old. Yes, I have been living with just a debit card all this time. I've been thinking about getting one for years, but the combination of not wanting to pay annual fees and wanting some sort of rewards system and not being able to make a decision meant I never had one. And then along came Banana Republic. I was already receiving some massive discounts on a recent trip to the flagship store, thanks to a big sale (oh so much pretty there), and the super-helpful salesgirl (no joke, she was great) convinced me to get one (further discounts! I shop here anyway!). I am usually impervious to the siren song of the store credit card...so why did I give in? For one, there is actually a decent rewards program when using my card at Banana Republic, Gap, and Old Navy (including the outlet). Those are the only places I actually shop for clothes anyway, so I might as well be earning rewards for doing it! I can use the card for other purchases, too (it's a Visa), which I may do eventually, but for now, I'm using it as a clothing shopping card. I figure this will keep me from spending too much each month, since I don't do much clothing shopping anyway. I will pay the balance every month (the one downside is a high interest rate - but I don't plan on carrying a balance on any credit card I might ever have). So yeah. Now I have a credit card. So far so good. I am considering getting a bank credit card through Wells Fargo when I open a new checking account (something I'm planning on doing relatively soon), just to have one for emergencies that has a low interest rate. Is this something that would be useful? I hate the idea of spending money I don't have (hence my being ok with a high interest rate on the BR card - I pay it off right after I spend it), but would it be a good idea to have a card I can use in a real emergency? Something with a low interest rate, in case I have to pay for something I don't have money for (I don't know what kind of emergency that would be...medical expenses? Isn't that what my emergency fund is for?)? Thoughts? Topic #2: Debts and Savings! Exciting news (for me)! I am thisclose to paying off my car loan! I've been working hard to get this paid off, doubling my payments for the last few months. I gave myself the arbitrary deadline of my birthday (May 10) to have paid off my car, and I am on track to come in ahead of schedule. I owe just over $1,000 and plan to pay $500 in March and the remainder in April. And I am stoked. Woo hoo! The plan was to then take the $500 I'm not spending on the car payment and put it into my "high interest" savings account, but since the interest on that account is pretty low right now, I have other plans. See, I also have this student loan. The loan was originally for about $18,000. I decided to check up on my account this morning, just for fun (ha). And according to the loan website, I have paid about $5,000 since I graduated in 2006 (minus about a year when I was on financial hardship deferment during an unpaid internship). And somehow, I still owe about $16,000. That's what we call stupidcrazyinterest. omg. So. Since the interest on my student loan is significantly higher than what I'd be earning in the savings account, I'm going to take that extra $500 a month and aggressively work on the student loan repayment instead. It's still going to take me forever to pay off, but if I'm paying $700 a month instead of $200 a month on it, at least it'll take a little less time. I'm still budgeting about $200 a month for savings (I like a steady contribution to my emergency fund), but I figure it's better to throw my "extra" money at the loan right now. It feels good to make grown-up decisions about my finances. Yes, already. Before I've even really begun to tackle the list. Last night, I wrote about the little (sort of big) plan I have for getting our condo (and my brain) back under control. I function much better when my home is a clean and organized place, and the results of three weekends out of town are starting to weigh on me. And what better time to take back control than a three day weekend? While yesterday was spent with the requisite lounging around, today brings a renewed sense of focus. I work best with deadlines and goals, even if they are all self-imposed. Perhaps especially if they're self-imposed, because then the onus is all on me. I thought I'd share a little of this process here, because it can be overwhelming to look at a long list of to-do's with nobody telling you how to tackle it, and maybe someone out there in blogland needs a little push. So here's how I sorted things for this weekend; maybe this example will help someone else who's trying to knock out a long list on a long weekend. Saturday: Lay around all day. Get some rest so I feel like I'm up to the task of cleaning. Note: laying around all day staring at the mess also helps with the motivation to clean. Start some laundry, since that's something that can be done while (mostly) laying around. This lounge day also helps me to figure out what I need in terms of groceries, cleaning supplies, etc - and to really get a handle on what I want to accomplish. Write a blog post talking about what I want to do, to put it out there and make it public. Sometimes I'll also just write it on a piece of paper and put it somewhere where I can see it. Get a pedicure, go to Trader Joe's (a reward for a couple more hours of work) - it helps to make an appointment for the pedicure so I have a clear stop-work/take-a-break time. File things in my file cabinet, a task I've put off for months. This should take care of my "Hers" pile of mail, etc. as well, so all that will be left is Will's pile. See what else I feel up to doing tonight, if anything. Watch a cheesy movie, preferably a chick flick. Wake up by 10am, eat breakfast, make sure things are ready for Super Secret Project, which is happening at 11. And that's it! I'm no expert, but this is generally what works for me. Happy weekending! I have been looking forward to this three day weekend for quite some time. We've been out of town the last three weekends in a row, and while it's been lovely to take some mini-vacations up to Lake Tahoe, I am wiped. You don't tend to sleep in much when you're waking up in the morning to head to the slopes (even if you're not a skier). We haven't been grocery shopping in almost a month, and there are piles of...life...everywhere. I look around the condo and I see laundry. And boxes. And papers. And y'all know that when my space is cluttered, my brain feels cluttered. I love a clean, organized space, and it stresses me out to live in a mess. Nothing like a rainy day to get cozy and nest! So I've been looking forward to this. I planned on sleeping in this morning, and while I ended up waking up at 9, I happily spent most of the day lounging on the couch in my PJ's, watching movies with Will, and just enjoying the feeling of sitting still. We did a bit of cleanup this afternoon, and now that we've gotten a good start on it, I look forward to waking up tomorrow and tackling the rest. I enjoy the whole "it's cold outside; I'm going to burrow inside my little home and let my homebody flag fly" thing (that's a thing, right?). And I like how when it rains, our patio gets all crazy flooded, but the water stops about two feet from the door (see pic). It stops just before the little couch, which is convenient. I think there must be a slight slope upwards towards the door. Anyway, I think it's funny. Like a little force field or something. Will is going on a little two-day ski trip (yes, this is his 4th weekend in a row!) so I'll be all by myself for the next two days. And honestly? I'm looking forward to it. I'm kind of excited to have the place to myself to power through some crazy cleanup. There's something about deciding to do it that gets me motivated, and somehow I find myself less motivated when Will's home. When he's home, I am definitely more likely to give in to lounging, snuggling on the couch watching our DVR'd shows. Perhaps because he's not necessarily the one who gets that "Yeah! Let's Clean!" bug. Perhaps because I like to be all "SURPRISE! See how awesome it is in here now?" when he gets home (this usually does get a good reaction, believe it or not). Perhaps because it's just a little "me" time, and this is what I like to do in my "me" time. laundry - 3 loads done tonight! Two loads done yesterday! Will probably do another load on Monday, but the hamper is officially back to normal! dishes - dishwasher is almost full, and as soon as the dish rack items dry, I'll be doing another load. pedicure - I need it! clear piles of mail from kitchen counter - moved to His and Hers piles on the kitchen cart (in the dining room), but at least they're not in the kitchen anymore! do something about "the island" - the pile of boxes we moved to make room in the living room on New Year's Eve, which is now in the bedroom, between the bed and the closet, which means I have to walk around "the island" to get to the closet, which is getting old. Commas! Niecy is full of sass. And side note - Clean House just came on the tv. Kismet? Happenstance? Clever scheduling? I'll take it. Niecy Nash is wearing a sassy, highlighter-hot pink dress, and I am loving her. Also, seeing these omghoarderswhoarealsokindacrazy people makes me feel a whole lot better about my mess. But it also makes me want to clean up and not have any spec of mess anywhere. Boom! Niecy, that is some décolletage. Niecy and her crony laughing it up at with the messy people. I don't ever want to be one of the messy people. I may have a small complex. All week long, all I've been able to think about is how excited I am to come home on Friday night, put on my PJs, and stay in all glorious weekend. I was looking forward to a 3-day weekend of lounging around, cleaning up the apartment, and generally just catching up on being a homebody. The rainstorm only heightened my excitement about going home and cozying up. And then...service delays on BART. Will sent me a text from BART in Berkeley, telling me that there was some sort of delay at West Oakland (a major hub of BART through which most trains must pass - including mine). Delays happen every so often, so I wasn't too worried. And then I saw the warning, that there was a major delay at the stations, and no trains were going in or out. And then, once I had squished onto a train, I asked the tired-looking people around me how long this particular train had been sitting there. "Oh, 5, 10 minutes or so" - not too bad. And then, the announcement. "ATTENTION PASSENGERS! This train will be turning around and heading to Millbrae, and will NOT be continuing on to the East Bay." Uhhh no thank you. That is the opposite of where I need to go. So I got off. The station announcer said that service to the East Bay was stopped, and they didn't know when it would be starting. "Well, screw this," I thought, and started to make my way back up to street level, where at least I'd have cell reception. Out of frustration, I exclaimed, "Anyone want to share a cab to Oakland?!" - someone did. She and I scurried up to the street and to an ATM, and then hunted down a cab. When we finally did (in the pouring rain, remember? ), the cabbie apologized and said he wouldn't cross the bridge. Because of traffic. Even when we offered to pay double. Frustrated, soaking wet, and out of options, I turned around and went back to the office. Where I now sit, with a beer and free cable and my laptop. Of course, as soon as I walked in the door, I got a text from a coworker saying he had gotten on a train and was in the East Bay, that service had been restored to the BART line. Damnit. I'm going to sit here with my beer for another half hour or so until things calm down, because I do not wish to get stuck in that mess underground again. When I get on that train, I want the station to be calm and empty (because I'll have to deal with the station agent dealing with my fare that's already been swiped one way on my transit pass), and I want a nice comfy (ish) seat on that train. I just want to go home, but at least I'm in a warm office with TV and a beer. Silver lining. I am kind of obsessed with Garfunkel and Oates. Why? They are hilarious. Duh. They just released their new, official, awesome video for "This Party Took a Turn for the Douche" which includes one of the most brilliant lines ever: "I ain't in love with you, cousin; I'm not George Michael Bluth." Yes. So enjoy. These girls are up there on my list of Awesome Musical/Comedy Groups That I Love (which includes The Lonely Island, Flight of the Conchords and of course, Dakaboom), and are even more awesome because they are ladies. And ladies in comedy are the best. Enjoy their new video, featuring some surprise guest appearances and some ridiculously quotable lines. PS I know I've talked about them before (and shared other hilarious videos), but the internet can't seem to find those old posts. Sadness. I'm still trying to figure out how to work out getting the internet (aka Google searching) to recognize my new custom URL as the same thing as my old .blogspot.com URL - which should be easy, since Google/Blogger did all the work for me. Come on, Google. I've got coworkers helping me sort it out, so hopefully this will be fixed soon. I am pleased to present the first in my series of Food Fete related reviews: Pamela's Products. I sampled a ton of cookies, and a cake and frosting mix, and even though I am not under any dietary restrictions that require me to eat gluten-free foods, I give Pamela and her Products two thumbs up! zee cake, made by me. and friends. and a monkey. Pamela's Products makes gluten free treats, from cookies to cheesecake, and boy are they good. The white chocolate cheesecake is so good I have been bugging my local Whole Foods to stock it. They don't. Yet. But you can get all kinds of other products by Pamela there...for a full list of where to get her treats, click here. Seriously, good stuff. And I can vouch for Pamela - she's very nice! Now, I would have taken pictures of all the cookies we tried. I am, however, impatient when it comes to cookies (and so are my friends), and somehow all the cookies were gone by the time I remembered my camera. Oops. I guess we liked them. We tried: Chunky Chocolate Chip, Organic Dark Chocolate - Chocolate Chunk, Organic Spicy Ginger with Crystallized Ginger, Ginger Mini Snapz, and Extreme Chocolate Mini Cookies. I have to say, while I am normally an All Chocolate All The Time kinda gal, I think I preferred the ginger! The Mini Snapz were perfectly crunchy little bites, and the big ones were soft and chewy; they had a nice spicy kick to them, and lovely little bits of crystallized ginger mixed in. I really dug those ginger cookies. When it comes to the chocolate chip, I think I just always prefer homemade, but I also really liked the chocolate mini cookies. Perfect with a mini glass of milk or just for a smaller sugar appetite. But yeah. Loved those ginger cookies. We brought the cookies along on a trip to Tahoe, and as I mentioned, they were quickly devoured. I remembered my camera for the cake making extravaganza - thank goodness, because the little monkey who helped us bake it had a really great time. Check out our little (10-photo, mostly of Monkey) slideshow for pics! This cake was seriously good. Somehow both dense and fluffy, and with a really delightful taste. I can see how the batter is versatile too; it would be great with various extracts and zests (lemon? orange? mmmm), and it would be great for cupcakes. Honestly, if you hadn't told me it was gluten free, I wouldn't have known. Delish. And the icing? I definitely used a spatula to scrape remnants out of the Cuisinart (yes, we made it - super easily - in the food processor! Love this thing!) and licked as much as I could. I was worried there wouldn't be enough, but there was plenty to cover the entire cake, and fill in between the layers, and allow for lots of spoon/spatula-licking as well. Mmmm! In case you're wondering, it was the Classic Vanilla Cake Mix and the Dark Chocolate Frosting Mix. The frosting seemed more like regular than dark chocolate, but I think you can tell that we liked it. I have always been a red-box-mix and frosting-in-a-can kinda girl, but I think from now on, I'm going to stick to Pamela's! This was seriously easy to make, and void of scary chemicals. I approve! Thanks, Pamela (and all the lovely people who help with your Products)! I can't wait to try the Baking & Pancake Mix and the Chocolate Brownie Mix you sent! Recently, I had the privilege of attending a little event called FoodFete (with my buddy Suki), where I had the opportunity to connect with truly great food vendors. We had a grand old time, sampling tasty treats and learning about some really cool products, and left the event with (literally) bags of goodies. Are you a food vendor of some sort? Do you want me to review your product? Do you have an event coming up? Let me know!